Archbishop Desmond Tutu breaks down in tears while listening to the testimony to the Truth and Reconciliation Commission of a man who was tortured by the apartheid security police, April 1996. On the second day of the Truth and Reconciliation Commission, while listening to Singqokwana Ernest Malgas describe how he was tortured by apartheid security police, Archbishop Desmond Tutu dropped his head in his hands and wept. On April 15, 1996, the Truth and Reconciliation Commission (TRC) opened with its first hearings at the East London City Hall. The TRC's task was to uncover the horrific crimes that took place under apartheid between 1960 and 1994. Here, these crimes would be publicly spoken about, acknowledged and ultimately help South Africans to find their way towards reconciliation and healing. As chairman of the TRC, Archbishop Desmond Tutu led the painful process. 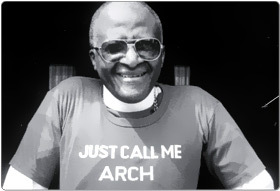 Regarded as a moral giant, Tutu himself had undergone arrest and interrogation at the notorious John Vorster Square. He shunned violence to resist apartheid, choosing instead to support economic sanctions and cultural and sports boycotts. In 1984, he was awarded the Nobel Peace Prize. "The truth is going to hurt," he warned as the TRC prepared for business. Day one was disrupted by a bomb threat, but the commission got down to business. The city hall was overflowing with people. Its first witness was Nonhle Mohapi. She spoke about her husband, black consciousness activist Mapetla Mohapi, who was never seen alive again after police took him into custody in 1976. On day two, former Robben Island prisoner Singqokwana Ernest Malgas was the last witness to give testimony. TRC deputy chairman Dr Alex Boraine told him: "Your situation is quite different from a whole lot of other people. You are a victim of torture, of harassment, of imprisonment, and we want you to tell us your story..."
The wheelchair-bound Malgas spoke with difficulty as the result of a stroke suffered in 1989, he believes as a result of years of torture at the hands of security police. He told how he had left South Africa for military training in the former Rhodesia. On his return, he was arrested by the East London security police and accused of being a terrorist. He said he had been tortured and "assaulted terribly" before being taken to Pretoria, charged and sentenced to 22 years in jail. On appeal - his defence lawyer was Nelson Mandela - the sentence was reduced to 14 years. He served the time on Robben Island. In all, he'd suffered three decades of arrest, detention, house arrest, assault, torture and harassment. He described his five-year house arrest: "You know, my life was always the life of harassment, the detectives were always coming, I couldn't even go to work and my wife had to be a breadwinner." In 1985, his house was burned down and acid poured over his son, Simphiwe, who died as a result. Frequent detentions followed: "I was being beaten up all the time during all these periods I was in custody, but there was no charge against me." In 1985, his house was burned down and acid poured over his son Simphiwe, who died as a result. Malgas reported the attack on his son to the authorities, but no action was ever taken. It was in the late 1980s, he said, that his health began to fail. After being released in 1989 from yet another detention, he went to hospital and was diagnosed with apoplexy. He had, however, not been able to afford the costs of physiotherapy or medication. Boraine addressed Malgas again: "I want to ask you a question, but if it is too painful for you to answer, that's fine... You have told us today that you were tortured many times in many different places. If you are able to, and it's not too painful, could you describe some of that torture?" Malgas responded: "During the torturing, I was always suffocated with a mask and there was this helicopter training. A stick was put inside your knees and you had to stretch your knees. During that period you were suffocated." At this point, Malgas began to sob. Tutu, in his purple robes, dropped his head onto his hands and wept openly, too. Tutu was comforted by fellow commissioner Hlengiwe Mkhize. With Tutu unable to verbally close the proceedings, Boraine quickly wrapped up for the day. Tutu was not the only person to weep at the cases of sheer horror and inhumanity he heard in that first week. Many other witnesses, members of the public and even a psychological counsellor wept. "It has been very traumatic. We are all deeply affected by what we have heard," TRC spokesman Phila Ngqumba told reporters after the East London hearings. Tutu told reporters he was not sure he was the right man for the job as he felt "weak". In one of many similar instances to come, Babalwa Mhlauli, whose father, Sicelo, was one of the Cradock Four, "We want to forgive, but we don't know whom to forgive." Tutu told witnesses like Mhlauli: "This is a tremendous country with tremendous people. You are an example of why we are going to make it in this country. The reason why we won the struggle was not because of guns, but because we had people like you - people of incredible strength." The reason why we won the struggle was not because of guns, but because we had people like you - people of incredible strength. Many victims wanted little more from the TRC than help in finding the remains of their missing loved ones so they could bury them, or providing tombstones for the graves of their murdered sons, husbands and fathers. Through the TRC process, more than 1 000 missing people were accounted for. A considerable percentage of the 21 000 victims gave testimony at the TRC and, according to the Ministry of Education's Every Step of the Way, their statements related to about 38 000 incidents and the killing of 14 000 people. The government agreed to pay all victims a once-off reparation of R30 000. The TRC purposely opened its hearings in the Eastern Cape. "One of the reasons... is because of the terrible oppression that has taken place here," Boraine said when he welcomed the widows of the Cradock Four to the hearings. "Of all those detained without trial in South Africa, one-third came from the Eastern Cape," journalist and TRC staffer Antjie Krog wrote later in her book Country of My Skull. "It was apparently assumed in security circles that whoever crushed the Eastern Cape would control the country." One by one, the perpetrators of horror applied for amnesty and told the TRC their versions of the truth. Eventually, 7 127 applied for amnesty; 1 146 applications were granted. The TRC formally closed its hearings on July 31 1998. Its amnesty hearings continued for another two years. In the foreword to the TRC's final report, released on March 21 2003, Tutu said: "It has been an incredible privilege for those of us who served the commission to preside over the process of healing a traumatised and wounded people." Wherever one goes, he said, South Africa's peaceful transition to democracy, culminating in the truth and reconciliation process, "is spoken of almost in reverent tones, as a phenomenon that is unique in the annals of history, one to be commended as a new way of living for humankind. Other countries have had truth commissions, and many more are following our example, but ours is regarded as the most ambitious, a kind of benchmark against which the rest are measured. "We have been privileged to help to heal a wounded people, though we ourselves have been, in Henri Nouwen's profound and felicitous phrase, 'wounded healers'. "Quite improbably, we as South Africans have become a beacon of hope to others locked in deadly conflict that peace, that a just resolution, is possible. If it could happen in South Africa, then it can certainly happen anywhere else." "It has been an incredible privilege to preside over the process of healing a traumatised and wounded people." In this lesson plan, learners will be offered the opportunity to think about the impact of personal testimony about apartheid-related events. They will also be asked to interpret a cartoon, and to think about the long-term effects of the Truth and Reconciliation Commission (TRC). Contains extract from the SABC’s coverage of the TRC showing the testimony of Singqokwana Ernest Malgas and Archbishop Tutu’s emotional reaction to it.